Lories love toys/entertainment. Please be careful as to which toys you select. Leather toys can harbor bacteria. Rope toys need to be monitored (frayed strings can tangle and hurt/kill a lory) Plastic chains are great for Lories when hung about the cage. Toys with bells or loose metallic openings can catch a Lories toenail/beak. Golf whiffle balls or whiffle soft balls are great. Cat toys (balls with bells in them). Be careful of the cheaper parakeet toys Lories can dismantle them. Be careful of what bowls you use for serving a Lory's food/water in. Some of the crocks have higher than desirable lead content in them. (I use the glazed clay brown crocks with blue inside (various sizes to accommodate various appetites). Plastic and some glass vessels are not good for nectar due to leching chemicals into the nectar/water. Stainless steel dishes or Coreile™ (these vessels are light weight and Lories tend to flip them around)are good. Some people have told me that they use water bottles as the source of water for their Lories. I do not think this is a very good idea at all. Bacteria builds up in water bottles. The ball bearings that are not accessible for cleaning. Then when used in conjunction with a powder diet the Lories are using this to wet the powder for consumption. 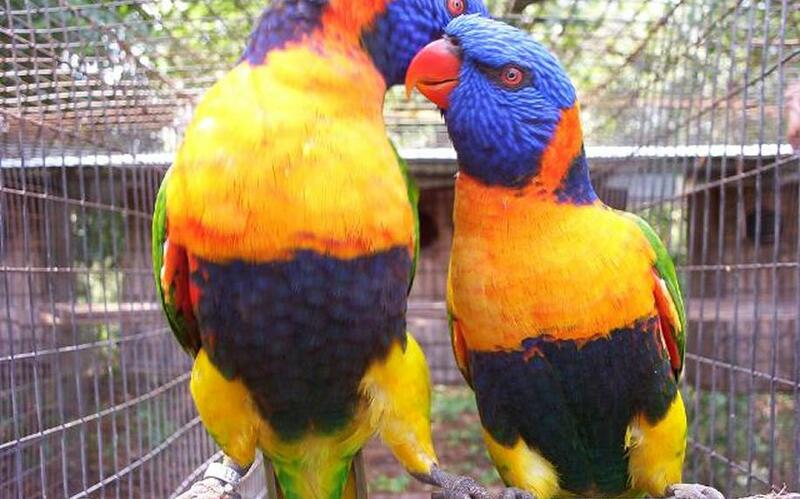 This is just a convenience for the Lory owner not good for the Lory. Lories need to bathe to clean their feathers. Sleeping accomdations. Lories love to sleep in a box (nestbox or day box)parrot tent (ones that hang inside the cage from the top) or even under a paper towel/newspaper. Please do not have your Lory sleep with you in bed. I have had several people throughout the years tell me that they do this and it doesnt end well (yes the Lory was crushed/suffocated). House Hold toxins. Bleach is a great disinfectant(5 minutes at a 10% solution is effective just dipping is not fully effective). Be careful of which type of bleach that you use. "Ultra" bleach contains SODIUM HYDROXIDE (LYE which of course is a poison) it makes it work faster but is difficult to wash off. Best type of bleach to use is the one containing SODIUM HYPOCHLORITE or SODIUM HYPOCHLORIDE. Teflon (non-stick coating on pots, pans and baking dishes) when heated is highly toxic to parrots (If this happens and bird is in breathing distress get bird to fresh air then vet. Their respiratory systems are much more sensitive than ours and can be victims of fumes. (hence the canary in the mine system from way back) Also be careful of new cages that are galvanized(bright shiny metallic ones) I just wanted to touch on these three toxins because that is the most that I hear about.